I haven’t done many reports recently, mainly due to lack of sessions and those the three I have had, have been pretty dire. Reports of increased whiting activity are not an interesting read and are even less interesting to write about. The weather of late hasn’t really done much to stimulate fishy action and hasn’t stimulated me enough to stride out onto the beach. However, I have suffered from withdrawal symptoms, so in a moment of madness and against my better judgement, I decided to hit Seaford beach on Sunday night armed with some lugworm and squid to see if anything was alive out there. I wasn’t expecting much to be honest, no wind to speak of and what there was came from the back of the beach and so there was no movement in the crystal clear water. The predicted temperature had been given as 4°C but it felt a lot, lot colder than that and I was glad of the floatie suit to keep me warm. I arrived at a spot at the deep and between the Martello and Splash Point about an hour before the 9pm or so low water and set up two rods. One used a live bait rig baited with the worm in the hope of hooking a whiting to act as the bait for anything bigger that might be lurking (hoping for a lucky cod). This was cast out at distance and left to do its work. The second rod had a size 1/0 two hook flapper baited with a worm/squid cocktail. Unlike previous trips, where the baits were hit straight away, things started slowly with no bites coming until the start of the flood tide whereupon, the live bait rig was hit with a typical whiting bite. The continuing rattling rod tip assured me that the bait was well hung on the small hook under the main 4/0. The second rod was hit a few times by whiting but no keepers. 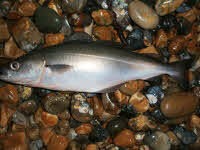 It was also hit by the universally disliked rockling which were annoying in their persistence at robbing baits. It kept on like this for most of the night until about two hours before high water, I got a good pull down on the flapper which sprang back and carried on bouncing away. I struck and on the retrieve it felt like a half reasonable fish, not huge but maybe a keeper. Once on the beach I saw the usual whiting on the top hook but was surprised to see a coalfish on the lower hook. It wasn’t big at around the pound mark but is a first for me in Sussex and my first ever from a beach like Seaford – also a new for my 2010 species list. I have heard reports of them being caught at the marina but not the beaches. I changed the live baits a few times but nothing seemed even remotely interested throughout the session. A few more whiting plus a couple of pout and rockling on the other rod saw me up to high water before the thought of a warmth of home and bed got the better of me and I jacked it in for the night. Until the conditions change and we get a bit of a blow to stir things up a bit, I can’t see me hitting the beach for a while.